Arduino enthusiasts looking for a new project to keep them busy over the coming weekend may be interested in this open source Arduino cocktail maker aptly named the HardWino. The HardWino has been created by Pierre Charlier and can be seen in action in the demonstration video below. Pierre Explained a little more about the progress of the project and how you choose Arduino to help affect the mixing mechanism. Here is my in progress project of automatic cocktail maker, HardWino. It’s not an innovate concept as you can find a lot of similar projects, but the purpose of this tutorial is to offer a low cost and easy way to do an arduino based cocktail maker. How it’s works? 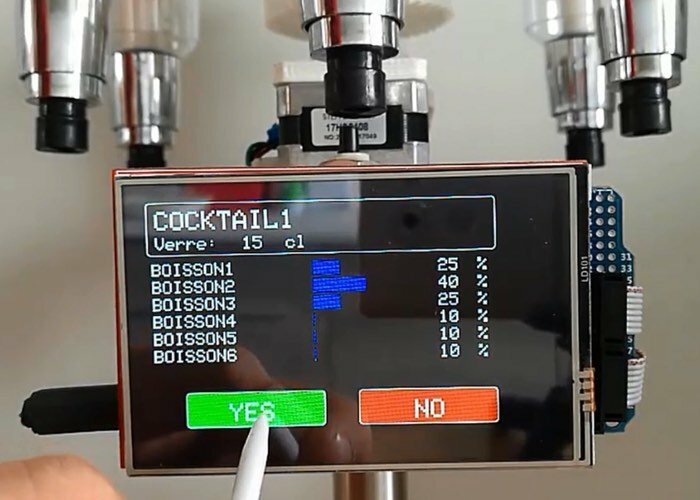 A touch screen with an Arduino MEGA allows to select your cocktail. A first motor (a NEMA17 controlled by L298 driver motor) turns the rotative drink holder to the first bottle then a linear motor (still drived by a L298) press the valve during a determined time. The first motor turn again for the second bottle etc etc. Once the cocktail is done, the first motor turn in reverse until activates limit switch. Then you can enjoy your drink! For more information on the new HardWino Arduino cocktail mixer jump over to the websites below for details. If you enjoyed this article you are sure to enjoy how to build your very own Arduino wind speed meter or anemometer project which is easy to build with basic Arduino skills.